What is fasting? This is a question I have been asked many times. It is a legitimate question, because this is a subject that is not widely taught in the churches much less practiced. You will read about fasting in the Bible, hear about it in your doctor’s office, and you may hear about it through nutritional and health programs. 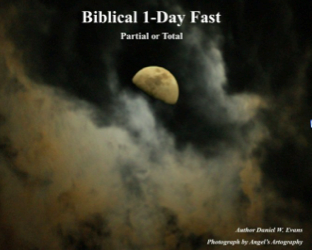 The dictionary definition of the word fast (fasting) is to abstain entirely from or limit food, to eat only sparingly or of certain types of food, or a period of self-denial. As we have briefly discussed different types of fasts, let’s move on to discuss the meaning of biblical fasting. What makes a biblical fast different from any other fast? The difference is that it is not only accomplished voluntarily by abstaining from food, but while practicing it, praying to God (the Creator of Heaven and earth), seeking Him during the fast, and following biblical guidelines are vital parts of the fast. As Christians, the practice of fasting is not necessary to ensure our salvation. But, we all live in a body, have a soul (mind, will and emotions), and live around people. These areas have the potential of creating circumstances that are hard to deal with and at times difficult to understand why we are facing a particular battle. Biblical fasting places you in a position to gain strength to work through these issues to get the help you need from God. In the Bible, fasting was practiced when the people of God faced personal, economical and famine hardships. They even fasted when facing their enemies. Fasting was also practiced when they started an assignment from God, and so many other examples. They dealt with the same issues of having a body, having a soul, and living around people, as we do today. There are other examples of a one-day fast. However, we will only share one biblical example. In 2 Chronicles chapter twenty, Jehoshaphat the king of Judah, had a great army to come against him with the intent to attack (V.1, 2). He feared, proclaimed a one-day fast throughout Judah, and they all came together to seek the Lord (v. 3, 4). Then the Lord spoke to Jehoshaphat and all Judah through a Levite prophet and said that the battle was not theirs, but His (v. 15). Then God gave him specific details on what he must do (verses 16, 17). The next day king Jehoshaphat appointed singers to go before the army and the enemy was smitten by their own hands (verses 21-24). It took three days for the spoils of riches and precious jewels to be carried off from the dead bodies of the armies (verse 25). On the fourth day they met in a valley to bless the Lord (verse 26). What a miraculous act of deliverance and accumulation of wealth because of fasting, praying and seeking God. My studies of the Word of God have revealed to me that the spiritual discipline of fasting itself is more important than naming specific biblical examples of fasting and using them only for certain needs. For example, partaking in a twenty-one-day fast and arbitrarily naming it a ‘Daniel Fast’ may not bring you understanding of a vision as it did Daniel in chapter 10. However, it will assist you in developing the Daniel kind of character that will prepare you to receive from God as Daniel and many other biblical patriarchs did when they fasted. I have taught on this subject and referenced it in my preaching and teaching on many occasions. Many people have asked questions that lead me to believe that many do not have an understanding of the discipline of fasting. I do not fast because my name is Daniel, but I do fast as Daniel did and many others mentioned in the Word of God. I realize that it is a discipline and that I must set my mind to practicing it with the help of the Holy Spirit. Part of making a discipline work is to know what you must do. According to the scripture we find that food is always involved in fasting. Therefore, whether you sacrifice activities and physical pleasures or not, the abstinence of food should always be included in your fasting. The decision whether you fast a meal, certain types of food, or all food for the entire fasting period remains between you and the Holy Spirit. It is important to keep in mind medications and other directions from your doctor. To learn more about fasting, visit our website by clicking here. While you are visiting the site check out the informative FAQ’s section with detailed answers to a list of questions.